"Great Music, Big Heart "
ELVIS PRESLEY: THE SEARCHER: Part I and Part II is an entertaining, captivating, and heartrending two-part documentary about one of the greatest singers/performers ever. The music is great, the interviews are profound and the audio clips of Elvis himself are incredible. ELVIS PRESLEY: THE SEARCHER: Part I and Part II is an entertaining, captivating and heartrending two-part documentary about one of the greatest singers and performers ever. Elvis grew up in poverty. His father even went to jail for forging a check to buy food for his family. He lived in a broken-down, shotgun house. The dire economic straights produced a great desire in Elvis to take care of his mother. His mother, in turn, had a great deal of love and care for Elvis because his twin brother had died at birth. Elvis’ life revolved around church, not just the great singing in white churches, but also, at a time of segregation, he spent a lot of time in Pentecostal black churches. So, the Gospel was his foundation, his inspiration and his great hope. At three years old, Elvis started singing in the church. When his family moved into government housing in Memphis, Tenn., Memphis was alive in the music scene, gospel and country, including black gospel radio, white gospel radio, country music, BB King, the Blackwood Brothers, Beale Street, and the Flamingo Room. In high school, Elvis didn’t fit until he sang at a high school talent show. Suddenly, everything changed. Working for an electric company, Elvis would drive back and forth in front of Sun Records. Finally, he got up enough nerve to enter and ask Sam Phillips to record him. Sam was looking for somebody who could bring black music sensibility into white country music. Elvis did just that. So, at 19, Elvis was a local phenomenon, who started the rock and roll music trend, was in love with God and loved his mother. Sam was pressing Elvis’ records and selling them out of the back of his car. Elvis was traveling the road playing all over the South. He had an incredible presence on stage. When he played the Louisiana Hayride, he could read the audience, and the audience went wild. Thus, he was picked up by his manager, who made him a household name, Col. Tom Parker. In the mid-50s, Parker got Elvis on the major TV shows, such as Milton Berle, Ed Sullivan, and Steve Allen, so his fame spread around the world. Suddenly, however, he was drafted. His mother was heartbroken and died before he went overseas to Germany. Elvis was always polite and went off to the Army to do his duty. Losing his mother was devastating, and the Army almost killed his career. In Part II, when Elvis returns from the Army, Col. Parker has to rebrand him. One way is that Col. Parker gets him into a series of really corny movies, although some of them were entertaining. The movies, however, stultified Elvis’ great artistic abilities. When he felt disassociated from his art, he finally demanded his next song be a record of gospel music. Even so, his 1968 TV special was a brilliant success. With the movies trivializing Elvis, Parker took him out on the road again, where he was doing two shows night after night, week after week, totally exhausted and sometimes overweight Although he married Priscilla, his career was consuming him, and after six years they divorced. His music reflected his loneliness and his hurt. He couldn’t shake Col. Parker, and the rest is history. He died too young, consuming too many uppers to stay awake and too many downers to go to sleep. Even so, his heart belonged to gospel music, his life revolved around faith and family. Elvis and his story are a tremendous portrait of the all-consuming nature of fame and the biblical passage, “For what will it profit a man if he gains the whole world and forfeits his soul?” (Matthew 16:26) However, the movie suggests he never lost his soul, which is in the hands of Jesus Christ. This documentary is fascinating, captivating, heartrending, and inspiring. The music is great, the interviews are profound, and the audio clips of Elvis himself are incredible. 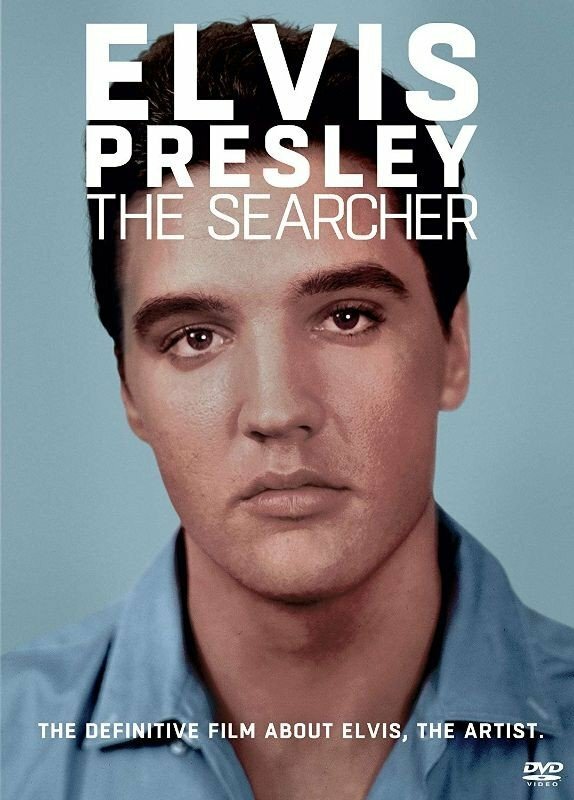 ELVIS PRESLEY: THE SEARCHER deserves an Emmy Award and deserves a big audience. Bravo! ELVIS PRESLEY: THE SEARCHER: Part I and Part II is an entertaining, captivating, heartrending two-part documentary. Elvis grew up in poverty. The dire economic straights produced a great desire in Elvis to take care of his mother. His mother, in turn, had a great deal of love and care for Elvis because his twin brother had died at birth. Elvis’ life revolved around church. So, the Gospel was his foundation, inspiration and great hope. After his family moved to Memphis, Tennessee, Elvis would drive back and forth by Sun Records. Finally, he got up enough nerve to enter and ask Sam Phillips to record him. The rest is history. Elvis and his story are a tremendous portrait of the all-consuming nature of fame and the biblical passage, “For what will it profit a man if he gains the whole world and forfeits his soul?” (Matthew 16:26) However, the movie suggests Elvis never lost his soul. This documentary is fascinating and inspiring. The music is great, the interviews are profound, and the audio clips of Elvis himself are incredible. ELVIS PRESLEY: THE SEARCHER deserves a big audience. Bravo!